The most distinguishing feature of the current location of the Arcade Library is the architecture. The library is built partially into the ground and has a distinctive blue tile roof. A remodel, completed in 2005, refurbished the building, providing more space for teens, a reading room for periodicals, new carpeting and furniture, and a design conducive to improved customer service. The Donald Dean Watson Community Room was named in honor of the donor who bequeathed $100,000 for the remodel. 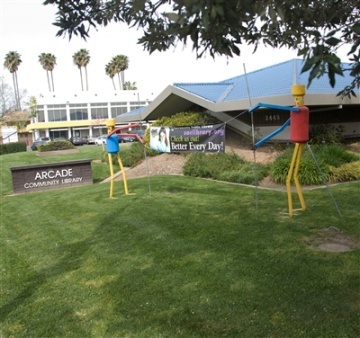 Arcade Library serves an urbanized commercial and residential area with a population of approximately 50,000 people. The library’s collection consists of roughly 80,000 items. These include books, magazines, audiobooks, DVDs, CDs, and CD- and DVD-ROMs. The 27 computers available for public use also provide Internet access. The community room may be scheduled for non-commercial purposes. Arcade Library has one of the larger collections of Russian-language materials in the Sacramento Public Library system. There are also smaller collections of Spanish, Persian, and Chinese-language materials. The library has a full-time children’s librarian who provides both preschool and school-age programming. The Library Literacy program, serving all of Sacramento County, is based here. Room is made available even during library closed hours for tutoring pairs to use. They offer family and adult programs regularly, as well. 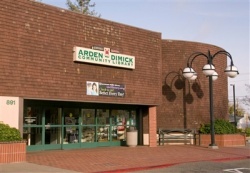 Originally established as a contract station of the Sacramento County Library System in the Arden School in 1948, the branch was moved to the Arden Town Shopping Center in 1951, and to its current location at the corner of Watt Avenue and Northrop in 1971. 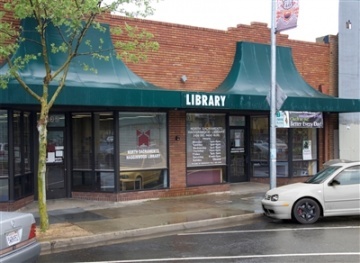 Its prime location provides library service for people from all parts of Sacramento and surrounding communities as well as being a highly valued "neighborhood" library. The Community Room hosts story times and special programs for children of all ages. Many of these programs are sponsored by the Arden-Dimick Friends of the Library. The Community Room is also well used as a location for programs of community interest and education. Arden-Dimick Library also features an attractive children’s area and a new teen corner. The library holds over 75,000 items which includes one of the largest collections of Deaf Services materials in the system, as well as a very popular offering of new large-print books. Many items in the collection are purchased with donations from patrons and from the Affiliate Friends group. Thanks to donations like these, Arden-Dimick Library is able to offer a wide variety of both fiction and non-fiction materials. The collection at Belle Cooledge Library numbers 90,000 items and there are 16 Internet terminals for public use, including a preschool computer. The library has a free meeting room for community-based organizations. The Belle Cooledge Library serves the Land Park, Greenhaven, and Pocket areas. It is part of a family-oriented complex that includes a community center and a children’s park/playground. Belle Cooledge is a delightfully active library with an annual circulation over 400,000. The community is tremendously supportive, with over 900 Affiliate Friends of the Library members. The Friends operate a small bookstore at the branch during open hours. The proceeds are used for library programs and materials. Belle Cooledge is a warm, inviting, and helpful neighborhood library, with a staff committed to providing excellent library service. The library is located adjacent to Belle Cooledge Park and across the street from the Belle Cooledge Community Center. The California State Library, a California public research institution, provides its customers with the accurate, up-to-date information they need to do their jobs easily, quickly, and confidently. 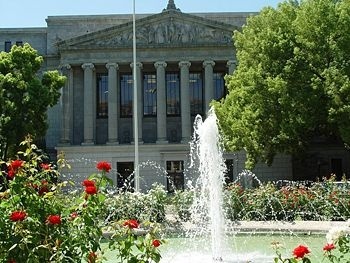 Whether you are an elected official, a state employee, a representative of one of California’s libraries, a person with special reading needs, or a member of the general public, the California State Library is here for you. The staff, including librarians, researchers, and consultants are at your service. 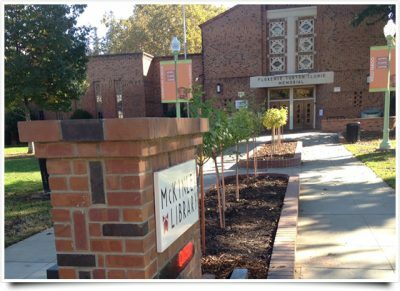 Carmichael Library reflects a multitude of improvements in customer asked-for, on-site, and online services. Customers can enjoy a seamless and successful library experience, as defined by their own expectations. They can choose their own method of interaction–staff assisted, self-directed, or virtual. Upon entering the library, customers encounter an airy, light-infused environment, enhanced by open ceilings and expanded windows. The large adult-reading area is punctuated with open shelving, comfortable seating, a living-room style reading area that fronts an expansive window that looks out to a patio with landscaping and a charming pergola. Elsewhere in the area, a tower window draws customers to other inspiring areas to read and work. Teens@ gives teens their own special area, designed with them in mind. The space has diner-style booths, colorful, comfy “curl up and read” chairs, innovative computer tables, and a large plasma TV. Exciting teen programs are offered throughout the year. Close by is a state-of-the-art, 24-station, computer center. The terminals provide access to the Internet, word processing, educational software, and the library’s online catalog and database resources. The space is designed to allow the Library to offer a variety of computer classes for customers of all ages. The Kids’ Place features a colorful reading tower, light-filled, and acoustically-enhanced–perfect for story times. The space offers six computers, including two computers with early-literacy software and learning games for children (age 0-8). The interactive LeapPad and LeapBooks learning system helps children develop language, reading, and other critical skills, all through electronic books and special touch pens. Parents and caregivers, who bring their toddlers and preschoolers to the branch will have a cozy place to share stories in the Ready to Read section of Kids’ Place. The special space features kid-sized furniture, just right for the smallest customers. Got a question? The Staff at the information desk have the answer. Not only that, library staff will be available, throughout the library, with electronic notebooks that connect to the online catalog and the Internet to assist customers wherever they are in the building. In addition, computers, with access to the online catalog, are located throughout the library for convenient use. The handsome, new community meeting room provides a gathering space for groups as large as 111. The room is accessorized with a media projector, drop-down film projection screen, and kitchen. A smaller community room, accommodating up to 20, is also available. The branch has books in world languages, including the special Persian Collection. The California Collection features literature about our state’s magnificent history. The Movies and Music section offers the latest DVDs and music compact discs for check-out. Chico artist Sheri Simons has created two thought-provoking artworks as part of the Sacramento Metropolitan Art Commission’s Art in Public Places program. A stone piece, Moment, resembling stacked books, is displayed on the corner to ensure that passers-by know where the library is. Suspended from the ceiling of the Kids’ Place reading tower is the metal sculpture, Auto-graph. The Central Library is the largest of the 28 libraries in the Sacramento Public Library System. It is located downtown near parking and public transportation. The original 1917 Carnegie building was greatly expanded in 1992 and includes kids’ and teens’ spaces, a Friends of the Library sale area, and rentable meeting rooms. The Central Library has an extensive collection of materials on Sacramento history, newspaper archives, genealogy (courtesy of the Genealogical Society of Sacramento), and materials for students and job seekers. It also houses the I Street Press, for writers who want to self-publish their work. The Central Library is also home to the Tsakopoulos Library Galleria. Colonial Heights Library is located at the corner of 21st Avenue and Stockton Boulevard and serves people located within a nine-square-mile area. The library opened in 1989, replacing the Mabel Gillis, Fruitridge, and Oak Park libraries. The library is easily accessible by public transportation. Colonial Heights has a total of 13 computer terminals for internet use. Two of the internet terminals are express (20 minute) computers and one terminal is for children. The collection has over 60,000 titles. The library has a community room that is regularly used for library programs. The community room is also available for community group meetings and activities. The Sacramento Public Library Foundation sponsors a Homework Center at the Colonial Heights Library. The Homework Center was opened in September 1998. The tutors are usually hired through Sacramento State University. The center is available for 1st through 8th grade students, and applications to be a part of the program are available at the library. The center also accepts drop-in students when there is available space. Located on the grounds of the Bates Elementary School, the Courtland Community Library serves the school children and the citizens of the town of Courtland and the surrounding fifteen square miles. The Courtland Library has a history going back to 1909. For almost 10 years it was operated by volunteers from the community-members of the Courtland Affiliate of the Friends of the Sacramento Public Library. Recently the volunteers applied for and received Community Block Grant funding for the development of a new building. 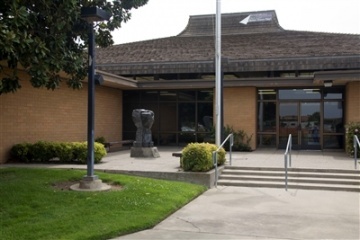 In partnership with the River Delta Unified School District, the Courtland Library will enhance service to children by circulation materials from the Bates Elementary School and by providing access to the complete holdings of the Sacramento Public Library to all users. The branch is now offering free Internet access to the community as well as word processing software. The Friends of the Courtland Library continue to provide volunteer service to the library and will pursue their fundraising efforts to support the branch materials collection and programming for children and adults. This library has a collection of over 30,000 items, including a large collection of audio books, DVDs, music CDs, and educational software CD-ROMs. There is also an excellent African-American culture collection in both fiction and nonfiction. In order to better meet the needs of an ethnically diverse community, the library also has collections of materials in Spanish, Russian, and Hmong. 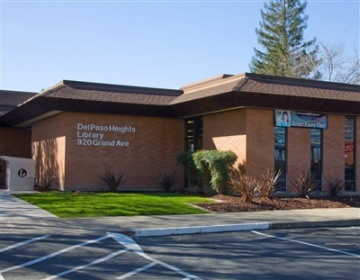 The Del Paso Heights Library offers friendly, professional service in a comfortable and safe atmosphere. With twelve public Internet computers, four of which are Gates Foundation computers with additional software, Del Paso Heights Library is an ideal place for doing word-processing, homework, research, and catching up on your social networking. The library also offers free Wi-Fi. The Del Paso Heights Library has recently expanded the kids’ and teen areas and now offers additional seating as well as a cozy storytime area. 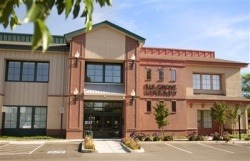 The Elk Grove Library was established in October 1908 as the first county “free library” in California. 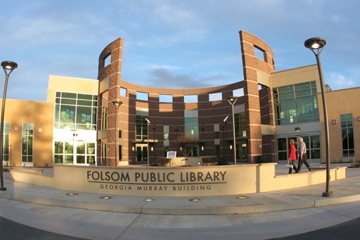 The 13,785-square-foot, city-owned, two-story building includes a group study room, a teen space, a community meeting room with an 80-seat capacity, 52 public-access computers, and a collection of thousands of books, periodicals, DVDs, CDs, and other materials. The branch will also feature a new electronic system that displays RFID technology to speed the return processing of checked-out books and other materials. 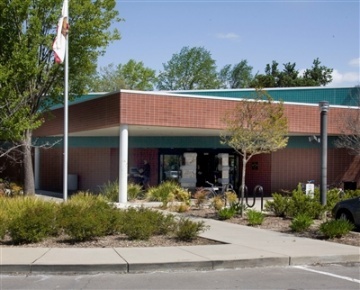 The Elk Grove Library serves not only Elk Grove but also neighboring communities, such as Vineyard, Wilton, Sloughhouse, and Rancho Murieta. The library is in the heart of downtown Elk Grove. It is surrounded by several elementary schools and Elk Grove High School, all within walking distance. 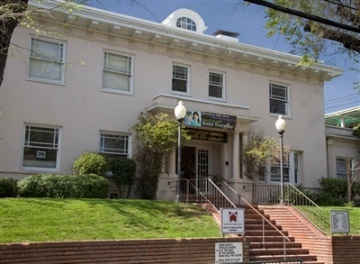 The Ella K. McClatchy Library is in a lovely older home on a quiet residential street in Midtown Sacramento. The building was designed by Northern California architect Rudolph Adam Herold in the early 1900s for Charles and Ella McClatchy and their family. The house became a library in 1940 after Eleanor McClatchy and Charlotte Maloney presented it to the City of Sacramento as a memorial to their mother. Although the library was originally a young people’s library, today it serves all ages. Along with a responsive collection, the library offers two public Internet stations, two Netbook laptop computers for onsite use, and WiFi access. There is a pretty little patio at the back of the building which patrons are welcome to use. Preschool story times will delight three- to five-year-olds. While entertaining programs for school-age kids as well as for teens take place all year round, they occur even more frequently during June, July, and August. Programs for adults have become popular events, as well. The Friends of Ella K. McClatchy Library is an exceptionally dedicated and active group which sponsors activities such as those listed above and more. There’s a book shop in the library’s Sunroom that includes magazines, costume jewelry, games, toys, and other donated items, as well as used books for sale. The Friends also host an annual Open House to celebrate the library’s birthday in mid-November. Everyone is cordially invited to stop by for a pleasant visit. Browse through sale materials in the Sunroom, gaze at the beautiful stained- glass window, get comfy on a window seat or in a beanbag chair, and, of course, check out lots of good books, magazines, CDs, or DVDs. Nestled on top of a hill next to the Fair Oaks Temple Park, the library is located just off the Southwest corner of Fair Oaks and Madison. The Fair Community Oaks Library with its Frank Lloyd Wright style architecture is a striking building surrounded by trees. The interior features a high open ceiling with brightly painted beams and ductwork. The library serves the area of Fair Oaks, Citrus Heights, Orangevale, and Gold River. It also serves a significant number of patrons from Folsom, El Dorado Hills, and Rocklin. 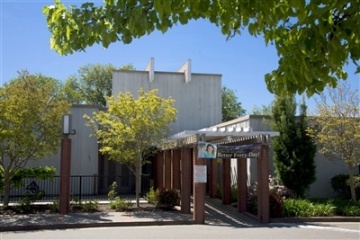 The Fair Oaks Community Library is most readily identified in the public mind with the small town of Fair Oaks, an attractive, affluent community with a population of about 41,000. The Fair Oaks Library is so near the Sunrise Mall and Birdcage Walk shopping centers (one mile distant) that it is also identified as part of the Citrus Heights community. The 12,000 square foot library building houses a materials collection of 72,000 items including many popular magazines and hundreds of audio books, videos, and CDs. A limited number of titles are available in Farsi, Russian, and Spanish. The kid’s room has child sized furniture, books, reference materials, audio books, videos, and CDs aimed to please the youth of the community. The library also offers 12 Internet stations, 9 library catalog/informational database computers, and a self check out machine. A meeting room is available to reserve for free community events for groups of 10-75 persons. Kids are welcome at the Fair Oaks Library. Story time is offered for preschoolers and toddlers. The popular summer reading program offers prizes and weekly family programs. Tours may be scheduled with reference staff and special events such as author visits, entertainers, and book-related gatherings are scheduled throughout the year. Adults may join the active monthly book discussion group or the Fair Oaks Affiliate Friends. This local Friends affiliate has over 100 members and sponsors three well-attended book sales each year raising thousands of dollars used to fund materials for the collection, children’s programs, and needed furnishings and equipment. The spacious 24,000-square-foot Georgia Murray Building is a state-of-the-art facility featuring separate areas for children, teens, and adults. Some areas of the library focus on lively activities and interactive programs, while other areas offer a more traditional environment for quiet reading and study. Advanced technology includes greatly enhanced access to the Internet, online catalogs, and databases. Patrons may use public computers in the adult, teen, and children’s areas. Wireless access for personal laptop computers is also available. A collection of 12,000 books, DVDs, and CDs is available to visitors. Patrons also continue to have access to extensive materials housed at all Sacramento Public library branches through online data bases. 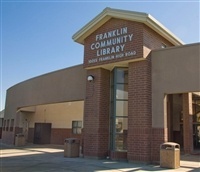 Franklin Community Library is cooperatively managed by the Elk Grove Unified School District and the Sacramento Public Library Authority. The branch serves the students of Franklin High School and Toby Johnson Middle School as well as the general public. The "down-home friendly" Galt Library was established in 1908 and is the second-oldest library in Sacramento County. In 1993 the City of Galt built the beautiful new Galt – Marian O. Lawrence Library, which is named after a former Galt mayor and dedicated supporter of the library. The library’s service area is in the southern part of Sacramento County and includes portions of northern San Joaquin County. Communities served include Galt, Wilton, Herald, Acampo, and Lockeford. Approximately 18,000 people reside within this geographical area. The library is particularly dedicated to serving the needs of children and students. It offers year-round special programming as well as weekly preschool story time. The library provides customized "homework collections," Internet access, and word processors for school reports. There is an extensive collection of materials in Spanish to serve the Hispanic community. The Galt – Marian O. Lawrence Library is a repository for Galt Historical Society materials, as well as City of Galt information and documents. Community support of the library has been impressive with many successful fundraisers sponsored by the Friends of Galt – Marian O. Lawrence Library. Gifts From the Heart’s goal is to be a business where employees can use their God-given talents to bring joy and blessings into the lives of those in the community of Elk Grove. The business will strive to be a place of hospitality that provides customers new opportunities to learn, create and celebrate all while making memories that will be cherished for a lifetime. The Kashenberg-Ostrow-Hayward (KOH) Library & Cultural Center is home to the Library of Jewish content as well as the Mosaic Law Congregation. It was established to provide a vast array of Jewish cultural programming in addition to a growing catalog of books and movies for loan. The center is open to the public. Funded by the Kashenberg, Ostrow, and Hayward families. Opened in May 1970, the Martin Luther King, Jr. Regional Library serves the Airport-Meadowview Community. As a Regional Library, it has the largest, most diverse collection in the south county and serves people from a wide geographic area. The book collection is approximately 110,000 volumes, 30,000 of which are children’s books. The collection contains materials in Chinese, Hmong, Russian, Spanish, and Vietnamese. The library houses a collection of materials about Martin Luther King, Jr. which includes adult and children’s books, audio tapes, and videos. Another special collection is the Samuel C. Pannell African American Collection, established in memory of the late Sacramento City Councilman, which contains adult fiction and non-fiction written by or about African Americans. The King library has 30 Internet terminals. 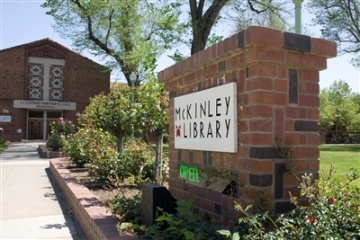 The McKinley Library is located in the north wing of the Clunie Clubhouse in lovely McKinley Park. The art-deco styled building opened in 1936. The library interior has been maintained with its original walnut paneling and Stickley furnishings. The marble fireplace is the focal point for the Children’s area. Weekly preschool storytime encourages young readers to come to the library. An active Friends Affiliates group meets the first Tuesday of every other month, and all interested members of the community are invited to attend. There are five Internet stations available for public use. Four of these stations offer a variety of Microsoft Office products. The other station is a 20-minute express machine. The collection of approximately 45,000 volumes is geared to meet the needs of the communities of East Sacramento, Midtown, and River Park. A superior gardening collection and many fine books on decorating and the home are well used by the local residents. A unique collection on the Arts and Crafts era with an emphasis on California bungalows, adds a special dimension to this wonderful neighborhood library. If you’re ever in the area, stop by, relax, gaze out at the park greenery, check out a good book and then stroll through the rose garden. The North Highlands-Antelope Library opened in December 2000. 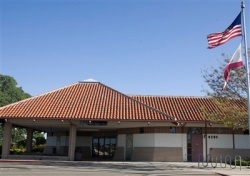 The library serves residents of the North Highlands and Antelope communities, as well as patrons from the surrounding areas of Foothill Farms and Citrus Heights. The 12,890 sq. ft. California mission style building is situated on a hillside beneath beautiful Sovereign Oak trees. The library features several pieces of public art created for the building by Sacramento artist Adam Romo, including a bronze sculpture, two mosaic panels, eleven decorative tiles, and interior acrylic plates. The North Highlands-Antelope Library has a collection of over 70,000 items, including hundreds of audio books, videos, and CDs. The self-check machines are very popular, with patrons checking out over 50% of their own materials. A community room is available for public meetings. The library has a supportive Affiliate Friends group. The Friends raise money for the branch with their book sales, sponsor a variety of programs, purchase needed materials, and actively promote the library in the community. 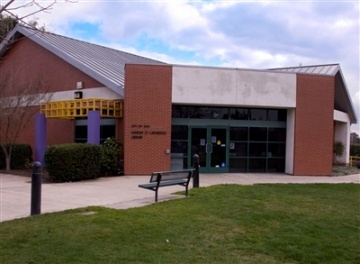 The North Natomas Library is a joint-use facility serving the North Natomas community, as well as the students, faculty, and staff of Inderkum High School and the Natomas Center of American River College. The North Natomas Library features 120 public-access computer stations; a computer lab and classroom, as well as a mobile, wireless lab with notebook computers; and a 75-seat-capacity community meeting room. Its collection of books, periodicals, DVDs, and CDs contains more than 100,000 items focused on community and student users. The branch also has two very special spaces, reflecting the Sacramento Public Library’s commitment to the community’s youth: a dynamic teen space and a children’s area. The Sacramento Metropolitan Arts Commission’s Art in Public Places committee has chosen the artworks by local artists to be displayed at the branch: Ray Gonzales, "Surfing the Stacks;" Joe Scarpa, "Authors of Our Own Destiny;" and James Piskoti, "Reading Is an Adventure." 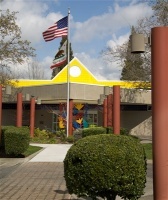 The North Sacramento-Hagginwood Library was formed in 1987 by joining the former North Sacramento and Hagginwood branches. It is located in the heart of the North Sacramento community. The library branch has approximately 42,000 items which include a growing Spanish- and Russian-language video, audio, CD, and DVD collection. The branch has eight Internet computers for public use and three laptops for in-library check out. A photocopy machine is also available. The Friends of the North Sacramento-Hagginwood Library sponsor fundraisers to provide special programs to enliven library service for the community. In addition to an on-going book sale, the Friends also sponsor counter sales of See’s lollipops. Located in a small shopping center on the south side of Greenback Lane, just west of Hazel Avenue and east of Beech Avenue this 4,320 square foot library is cozy and inviting. The library provides popular adult reading and children’s materials to the citizens of Orangevale and is an integral part of that community. 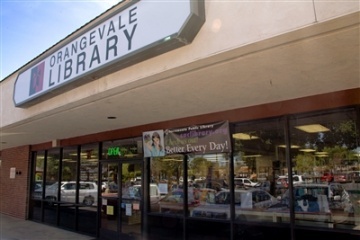 The town of Orange Vale was founded in 1888 as a new development for farms and orchards and has had a library since 1912. Today, the people of Orangevale take pride in preserving a quiet, rural quality of life, even though the population has grown to over 30,000. The library now holds over 34,000 items such as videos, books-on-tape, music and books on CDs, CD-ROMs for children, large-print books, periodicals, and some materials in Spanish. In addition, there are library catalogs with useful and interesting databases, public Internet terminals, and word processors. Children’s programs are presented monthly. The Orangevale Library has an active support group in the Friends Affiliate of the Orangevale Library. The Friends sponsor programs for adults and children, purchase materials for the library through funding from book sales and other events as well as acting as representatives of the library to the community and for the community to the library. 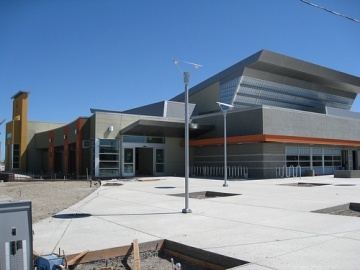 Opened on August 28, 2010, the Robbie Waters Pocket-Greenhaven Library proudly serves the Pocket-Greenhaven neighborhood and surrounding communities. In addition to serving the general public as a branch of the Sacramento Public Library, the library shares its facilities with the School of Engineering & Sciences, an open-enrollment school serving 7th through 12th grade students who would like to pursue careers in engineering and sciences. Strongly supported by the community and the Friends of the Library, the library branch holds a LEED Silver accreditation for its many ecological design elements, including recycled materials, drought tolerant landscaping, and motion sensor lighting. It contains a collection of 67,000 items, has 15 public internet access terminals plus 20 Netbooks available for in-library use, RFID technology, and a community meeting room that seats 82 people. The branch also features two areas especially for youth. The enclosed teen area offers booth seating, four internet access terminals, and tables featuring electrical outlets for easy use of portable technology. The Ready to Read room is especially for the youngest library patrons, those aged 0-5, and provides a variety of early literacy activity stations. This room was paid for, in part, by a generous donation by the Fong family in memory of Michelle Fong Beam.